GMATPrep 640 and 700! GMAT in 3 days!! In the second test, during quant I wasn’t able to solve most of the tough questions that I got but used logical guessing which I was luckily getting right. Got only 8 out of 31 wrong. Whereas, got 14 wrong in the first test in verbal and got 35 and got 12 wrong in the second test, but got 33. How accurate is this for the final test? My exam is scheduled for March 19th. Any inputs on the last three days?? 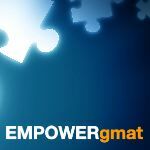 To start, since your Official GMAT is now less than 4 days away, you should NOT be doing too much studying (so NO more CATs and NO "cramming"). Some light practice and review would be fine, but you would be better served by getting some extra rest so that you can go into Test Day calm, clear-headed and ready to work. Based on these two CAT results - assuming that you had NOT taken either of those Exams before (and you had NOT seen any 'repeat' questions) - it's still unclear what your actual 'ability level' is in the Quant section. You may have made a bunch of silly/little mistakes on the 1st CAT that you did not make on the 2nd... and/or you have have gotten 'lucky' on a handle of questions on the 2nd CAT. Without knowing how you scored on all of your OTHER CATs, we don't have the necessary data to define whether there are any patterns in your performances (or a progression in your scores based on your studies over time). Either way, you're too close to your Test Day to make any big changes to how you handle the Quant section. Assuming that you took this CAT in a realistic fashion and performed up to your ability, then we have to assume that this result is one that you have the capacity to hit again on the Official GMAT. For the purposes of getting in the right mindset for Test Day, you have to remember that the GMAT will always give you the Score that you EARN - so with every question you face (in the Quant and in the Verbal), you have to put in all of the necessary work (on your PAD) to make sure that you're earning the correct answer in a reasonable amount of time. For what it's worth, I haven't heard of anyone guessing their way from a Q43 (47%) to a Q50 (85%), so it could very well be that you are better than you seem to think you are. However, whatever you got on your practice tests is in the past. Focus on the actual exam now. Try to maintain a pace that you are comfortable with, and try not to change your approach during the test. Since your test is tomorrow, I hope you are taking it easy today. Let us know how things turn out. Good luck!